So it’s another beautiful flying day and you have planned (or spontaneously planned) a flight in your chopper. It might just be a short few miles, or maybe an overnighter. You’ve lodged your flight plan, notified the appropriate authorities, organised fuel and researched your route with alternatives, checked radio frequencies, programmed the GPS etc. The chopper is given a thorough pre-flight, log books checked etc… Bags packed (if any) and you are ready to go!… or are you?? Although there are many details not included here, we are referring to one often overlooked preparation for ANY flight! Did you pack a survival kit? 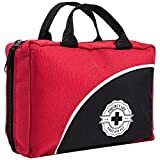 The importance of a survival kit may be obvious but to some who may think, “I’m just flying to the next town or even just the next field, so should I be fine”, well – how many times have we heard of motor vehicle accidents on major roads and even highways where people were not found for days? They just happened to end up in a place of low visibility which left them injured and in danger, behind a tree, off a ledge or in a ditch. A survival kit packed with a whistle, signal flare, survival mirror or back-up radio could save your life! Sometimes a simple tool or other item can mean the difference between life and death but having a basic survival kit with you is commonly overlooked. We have all heard of stories of people dying of thirst in deserts, bleeding out from injuries or even cutting off there own arms just to save their life. Who of these people were adequately prepared? Though it may add but a few pounds/kilos to your gross weight calculations, it should be considered as a part of your standard aircraft equipment for every flight that is checked during every pre-flight, and not thought of as additional cargo or luggage. Water – at least 24hrs worth as a minimum! Now while there is no set standard for what might be included in your kit, the above suggestions may help get you started. There are many different factors that may determine what’s in your helicopter survival kit such as environmental conditions – terrain, weather, day or night etc. What is important is to have something in the way of survival and first aid response so you are never caught short handed should the need arise. Now when I said “Basic First Aid Kit” – well we all know that would include at least some band-aids, bandage and antiseptic but again this boils down to an individuals needs plus the various flight parameters and duration. On the other hand if I was considering flying over heavily wooded areas my first aid kit may include items more so for lacerations and broken bones, maybe some pain killers? Maybe an obvious but often overlooked addition to your first aid kit would be prescription medication or preventative medicines such as for hay fever or blood pressure medication. Recently, after a look over some hunting areas in Canada, I was in San Francisco and visited a few hunting and outdoor shops in anticipation of my trip north. One well-known ‘outfitter’, as they call themselves, had two pre-packaged kits on offer. A mini-survival kit measuring about 10x15x6cm and a Cold Weather Mini Kit about 20x15x6cm, both packed in waterproof, shatterproof plastic cases. Predictably, they were made and packed in China. The see-through packaging was appealing and would attract the eye of a kindly relative searching for a present for you. The bad news about the containers was that prior to the trip, if you didn’t open them at home with a substantial screw driver and the thing held in a vice, you weren’t going to open them at all! “Sorry about the emergency, mate; I can’t open my survival kit!” The waterproofing gaskets were stuck down in the factory with some goo that had a lot of grip. All efforts to open them in my hotel room proved fruitless. I even considered sawing the darn things in half with my Swiss Army knife. This, I resisted, so opening had to wait until I was back in my workshop. The survival kit contained seven items: emergency blanket, mini-flashlight with a battery, small multi-tool, whistle on a lanyard, mini-karabiner attached to the carrying cord, box of waterproof matches and six Band-Aids. One disadvantage of a plastic container, apart from the bulky hinge and closure, is that it is difficult to heat water in it. Although the tiny multi-tool was really too small to be of much use and the karabiner was only strong enough to tie up your pet rabbit, the other items were of reasonable quality, even if their utility was questionable. In the list of contents of the Cold Weather Mini Kit, you find a fleecy ear band (which takes up more than half the available space), a very small pocket knife (a Swiss Army knife knock-off), instant hand-warmer, packet of instant cocoa, lip balm, box of waterproof matches and a keychain (yes, a keychain), but you find it attached to a compass/thermometer. The matches have big heads and long stems and work very well. However, just imagine yourself in the scrub, snow up to your ears, with a packet of instant cocoa in one hand and a box of matches in the other, searching for a discarded drink can in which to make your life-saving beverage. Am I being too hard on these well-intentioned folk? I don’t believe that there is a ‘one-size-fits-all’ survival kit. Readers of this column know that differences in terrain and climate demand different responses in terms of survival. After all, terrain, climate, vegetation and other factors alter the distribution of game and it is obvious that they also change the necessities required for humans to survive. While a pre-packaged kit may be a good basis from which to start, don’t depend on it. And keep your eyes out for these kits in shops because I predict that it won’t be long before they arrive. This was a survivable crash – but an emergency kit will increase your survival chances dramatically. Wind shear is a weather phenomenon where a sudden and large increase in an airplane’s headwind is quickly followed by a sudden and large increase in the aircraft’s tail wind. A microburst is one form of wind shear that can generate hazardous low-altitude conditions for aviation. The vast majority of wind shears are in fact microburst, which is why the terms wind shear and microburst are often used interchangeably. A microburst is formed when a column of air at high altitude cools quickly due to evaporation of ice, snow, or rain. The cooling air becomes denser than the surrounding atmosphere and falls rapidly to the ground. When it nears the ground, this downward air spreads rapidly in all directions away from the descending core (see the above figure), Many pilots have encountered with-speed changes in excess of 80 knots over a one mile distance. Symmetric Microburst; An aircraft transiting the microburst would experience equal headwinds and tail winds. An aircraft flying through a microburst may experience extremely hazardous air speed fluctuations. As the aircraft enters the downburst outdraft, it initially encounters an increased headwind. This headwind increases the aircraft’s lift, and thus its airspeed and altitude. A pilot unaware that these increases are due to a wind shear will most likely react by reducing engine power to correct the aircraft’s approach angle. The aircraft then passes into the vertically descending microburst core where it encounters an abrupt change from headwind to down winds, resulting in the loss of lift and altitude. Immediately thereafter, the aircraft crosses into a region of tailwind. This wind change reduces the aircraft’s relative speed and further decreases lift, which causes the aircraft to lose more altitude. Because the aircraft is now flying on reduced power, it is vulnerable to sudden losses in airspeed and altitude. The pilot may be able to escape the microburst by adding more power to the engines. Yet if the engines cannot respond fast enough or if the wind shear is too strong, the aircraft may crash. Microburst are extremely difficult to detect. In the NASA AWDAP research program, some measured less than 2.5 miles in diameter and lasted only 5 to 10 minutes. The best action a pilot can take upon encountering a large sudden increase of airspeed, with the aircraft attitude remaining level, is to hold constant attitude and if anything, increase power to counter the coming down and tail wind. Redback Aviation's information page on preparing your helicopter with emergency survival kits. Having a first aid kit will increase your chance of survival. Be the first to comment on "Pilot Survival Kit – Flight Survival Kits"